1.Prepare Bourbon-Chipotle Butter: In medium bowl, stir together all ingredients. Cover and refrigerate up to 5 days. Makes about 1 cup. 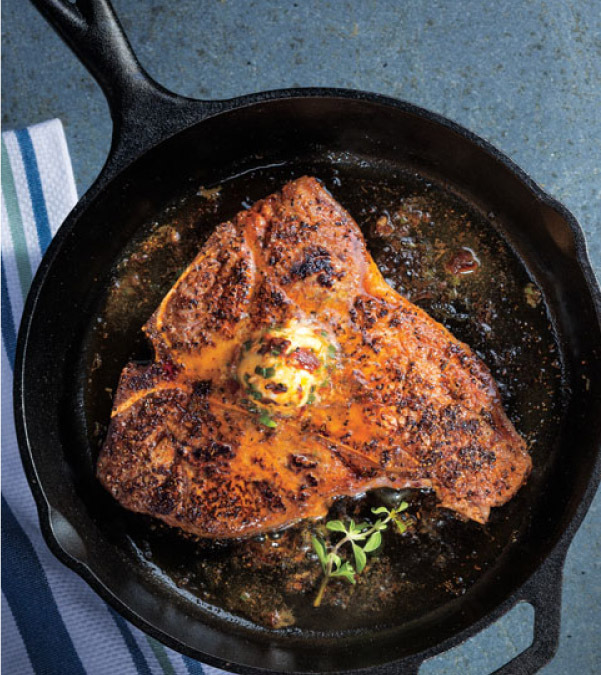 2.Prepare Porterhouse Steak: In small bowl, combine black pepper, paprika, oregano, salt and cayenne. Sprinkle both sides of steak with seasoning mixture; coat steak with oil and let stand 30 minutes. 3.Heat medium cast iron skillet over high heat until hot. Add steak and cook 10 minutes or until browned and internal temperature reaches 145°F for medium doneness, turning once halfway through cooking; top steak with 2 tablespoons Bourbon-Chipotle Butter during last 2 minutes of cooking. Let stand 5 minutes before serving; garnish with oregano sprigs, if desired. > If using a thinner steak, reduce heat to medium to finish cooking the steak once the outside has browned. > Serve leftover butter over sautéed vegetables, stir into scrambled eggs or mashed potatoes, or use in a Southwest-inspired shrimp scampi.